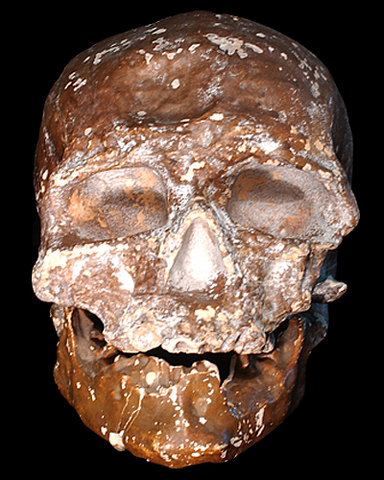 Cro-Magnon 1 consists of a relatively complete cranium and associated mandible belonging to an adult male and dating to approximately 32-30 Ka. The skeleton displays classic modern human characteristics, such as a high, vertical forehead, large cranial capacity (~1,600 cc); and the presence of a chin1,3. The lack of teeth in combination with reabsoption of the mandible indicate that the individual was probably of advanced age. Pitting seen on the cranium results from a fungal infection2. Klein RG. 2009. The Human Career: Human Biological and Cultural Origins Third Edition. Chicago: The University of Chicago Press.